Thanks to the help of Wefi I've relearned some of the old techniques I used to use as well as some new tricks, and I've begun the process of recreating my old Emperor's Shadow Guard armor mod, but better. Lots of hex editing, texture edits (beyond the normal recolor, I also altered the normal maps) and punchout method (I actually used the Royal Guard model for the helmet) was involved. 1. Refine the textures a little bit (for example the textures on the shoulder and bracer armor isn't showing up completely black like I want it to and I need to get all the textures to more or less show the same shade of black. 2. 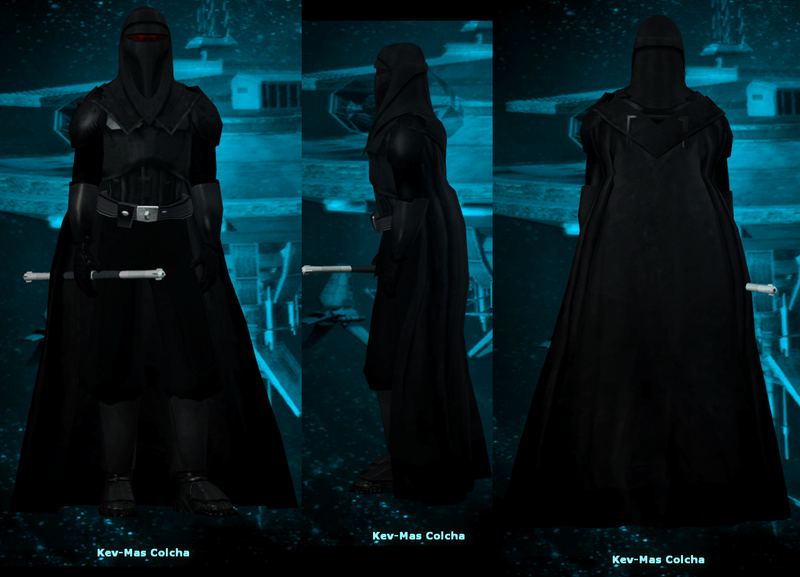 Add in a cape, likely the Vader cape that some popular mods of the past have done. I'll retexture it to look more like the "fabric" in the royal guard model instead of the heavy ribbed fabric of Darth Vader's cape. 3. Add in the gloves and boots. Update: The mod is just about finished. I just need to organize the files and put together a release. Beautiful combination! I love the cape and helmet - pulls the whole thing together! Kev-Mas, are you playing on EiF currently? If so, we can discuss getting a version of this in the game. Yeah I am, off and on. It actually might be neat to get an NPC Kev-Mas to show up for an event wearing this armor (or a variant of it, rather, as he'll be an ex-Imperial) once the game progresses in the timeline to somewhere around 6 or 7 ABY. At least if that's doable. If nothing else, we can get a version in-game acquirable at least by you so that other players see it if you're using it. That'd be cool as well. I'll work on the variant for that time now then.